Dennis Knight fired another wonder strike to push Jarrow Roofing to a close-fought 1-0 win over Newton Aycliffe last night, boosting their Northern League Division One survival hopes. With seven minutes remaining, Knight collected the ball outside of the box and cut inside onto his left foot before smashing a deliciously fierce shot past keeper James Winter to settle the issue. In truth, Roofing could have been ahead earlier were it not for two smart saves by Winter, denying Knight and Martin at his near post. 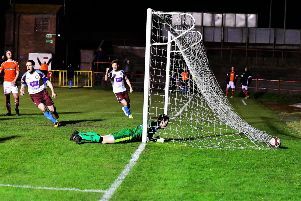 Yet the game was never clear-cut for the Roofers as Aycliffe battled hard throughout and created some threatening positions, but were unable to test keeper Dan Regan. And, with Knight’s 25th league goal of the season, Roofing were able to see the game through. “It was an excellent team performance, full of guile and commitment, and that has reaped six points for us in these past few days,” said joint boss Richie McLoughlin after the game. A second clean sheet in a row, after Saturday’s 3-0 win at Newcastle Benfield, was down to what McLoughlin has called for in recent weeks. Roofing face two more games this week which could see them draw level with the two clubs immediately above them. The South Tynesiders host West Auckland Town at Boldon tomorrow before the return league match against Aycliffe on Saturday. And after drawing to within three points of both Bishop Auckland and Penrith, the Roofers will be watching out for tonight’s game at Heritage Park, where Bishops host Sunderland RCA and re-establish two games in hand for the Roofers on the Two Blues. “A lot of people had us dead and buried in this league, but we said that we would keep fighting,” McLoughlin added. “The players have shown that they are up for the fight, but all we have at the moment is six points this week. l In Division Two, Jarrow drew 2-2 at Chester-le-Street after twice leading with efforts from Stephen Graham (17 minutes) and Kris Goss (58). Kevin Dixon and Alex Walker equalised in turn.